AMAZING WATERFRONT OF HAMILTON RESERVOIR!! Immaculate waterfront on Hamilton Reservoir! This is the one you've been waiting for! This fantastic home has been completely renovated down to the studs and a 2nd floor was added, all within the last 3 years! NEW windows, siding, heat, 1.5 baths, 3 bedrooms, den, flooring, insulation, plumbing, electrical, roof, deck, and patio. Only 15 minutes from the MA Pike in Sturbridge or Palmer and only 5 minutes from Rt 84! Brand new interior, renovated down to the studs! Sunroom, den, open floor plan, balcony and woodstove! 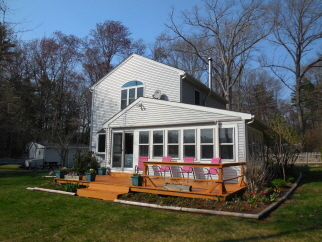 New siding, windows, insulation, roof, patio, deck and beautiful established gardens! 145' of prime WATERFRONT!!! Conventional 3 bedroom septic and drilled well! Dock, garage, patio, shed and swimming dock included!